Hillenbrand, Laura. 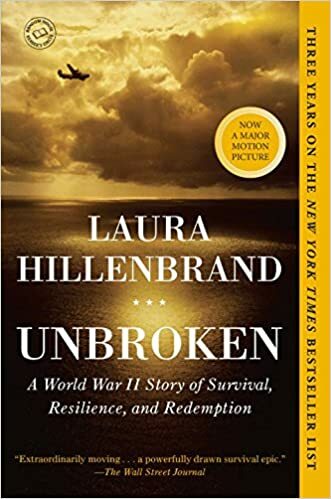 Unbroken: A World War II Story of Survival, Resilience, and Redemption. Random House: 2010. A story with a blurb like that could be set almost anywhere, from grim fantasy to grim sci fi to grim urban fantasy to just grim. Even when we add details like the hero is a best-in-the-whole-world-level middle distance runner, had to survive on the open sea for like a gazillion days, and was captured by the enemy and then tormented by an almost shockingly evil jerkazoid, it still sounds super fictional. But here’s where things get really crazy: as literally all of you dear readers already know, Unbroken is a freakin’ true story! Whaaaaat? Yes, that’s right: Louis Zamperini really was an Olympic competitor (and was close to a 4-minute mile! ), crashed in his B-24 and, along with two companions (then one), he survived on a life raft for almost nine weeks as he drifted across half the Pacific, was captured by the Japanese and held as a POW for about three years, during which time he was brutally beaten and starved, at times nearly to death. But the best part is, with all that grim, we still get a novel-esque happy ending—he lived into his 90s! This Stranger than Fiction message brought to you by Zhaoyun, who mostly reads and reviews *actual* fiction for Nerds of a Feather, and has done so since 2013.